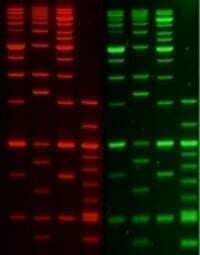 PAGE GelGreen® is a non-toxic, non-mutagenic green DNA gel stain specifically designed to stain DNA in polyacrylamide gels. PAGE GelGreen® can be imaged using a 254 nm UV transilluminator with a SYBR® Green filter, or with gel readers equipped with visible light excitation, such as Dark Reader® imaging systems or 488 nm laser-based gel scanners. While PAGE GelGreen® also can be used to stain DNA in agarose gels, Biotium’s original GelGreen® nucleic acid gel stain (catalog number 41005) is more sensitive for agarose gel applications. PAGE GelGreen® can be removed from DNA after agarose gel staining using commonly available gel extraction kits. PAGE GelGreen® is 2-3 times more sensitive for dsDNA over RNA. For detailed information, please visit the DNA Stain Technology page. PAGE GelGreen® was subjected to a series of tests at Biotium and two independent laboratories to assess the dye’s safety for routine handling and disposal. Laboratory tests show that the dye is impenetrable to latex or nitrile gloves and cell membranes. Unlike the highly mutagenic EtBr and the reportedly mutation-enhancing SYBR® Green I (1), PAGE GelGreen® is non-toxic and non-mutagenic in bacterial AMES tests at concentrations well above the working concentrations used in gel staining. PAGE GelGreen® successfully passed environmental safety tests in compliance with CCR Title 22 Hazardous Waste Characterization, under which it is classified as non-hazardous waste. A complete safety report is available under the downloads tab. PAGE GelGreen® is a ready-to-use staining solution that is available in 1X in water and 10,000X in water. Also see PAGE GelRed®. SYBR is a registered trademark of Thermo Fisher Scientific. Dark Reader is a registered trademark of Clare Chemical. 1. Mutation Research 492, 91 (2001).